So the vacation is over and the fun has begun. We are working on more and more great things for you to see at The Girls at Rusted Gingham's Barn Sale. 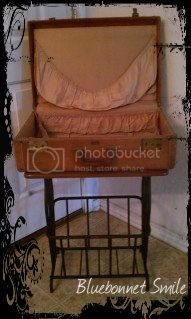 Just can not wait to show you what goodies we will be filling this great little table with. And who knows, you may just find a for sale sign on the table too. Isn't it wonderful! Love it! Love it! Can't wait!